Northumberland is in the north-east of England, bordering Scotland. It has some of the most scenic countryside in England, and holidaymakers can enjoy Areas of Outstanding Natural Beauty at the North Pennines and Northumberland Coast, and the rolling Cheviot Hills in the Northumberland National Park. 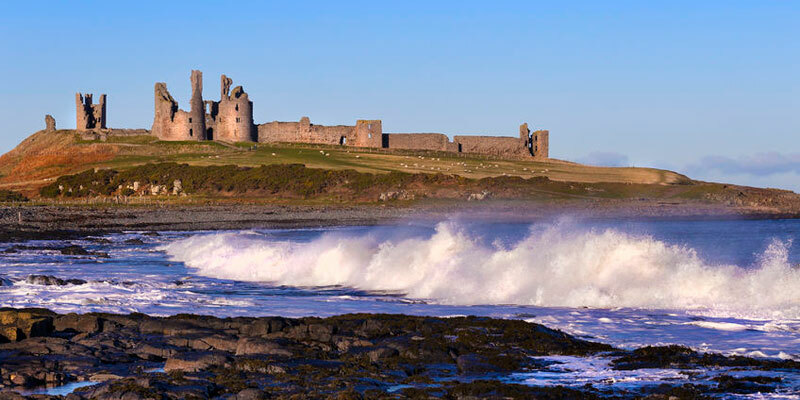 Northumberland was once part of the Roman Empire and has been the scene of many wars between England and Scotland. There are more castles here than anywhere else in England, including those at Alnwick (familiar as Harry Potter's Hogwarts School), Bamburgh, Dunstanburgh and Warkworth. It is home to much of the famous Hadrian’s wall, and its route is now a World Heritage Site and National Trail. As well as the wall itself the remains of many Roman settlements can be found, including Housesteads fort, and Chesters Fort. Northumberland is also often called the 'cradle of Christianity' in England, because it was on Lindisfarne, also called Holy Island, that Christianity flourished when monks from Iona were sent to convert the English. From hotels, to quaint bed and breakfasts and fabulous self-catering cottages, there is plenty of choice. There are also many excellent campsites and caravan parks. There is a huge range of attractions, places to eat and other activities to suit all tastes, including the outstanding Kielder Water and Forest Park, named the most tranquil place in England. So come and discover the beauty of Northumberland.